BJD MP Baijayant "Jay" Panda holds a private pilot licence for aircraft and helicopters. New Delhi: "Would love to fly in a chopper some day - although not privileged enough to afford one today but sure am ambitious enough to get there someday." This tweet by Sujay Kalpana Pradhan, who goes by the username @sujay365 on Twitter, was "liked" by Biju Janata Dal or BJD MP Baijayant "Jay" Panda on April 17. A month later, Dr Pradhan found himself posting selfies from inside Mr Panda's personal helicopter. Dr Pradhan posted four pictures on Twitter on Thursday. Among them, a smiling selfie with a kurta-clad Mr Panda wearing sunglasses and a visor. Dr Pradhan writes he accompanied Mr Panda on his "personal chopper." Just had the privilege of accompanying @PandaJay sir on his personal chopper - sir it's an honor . The politician too tweeted a selfie of the two of them inside the helicopter. 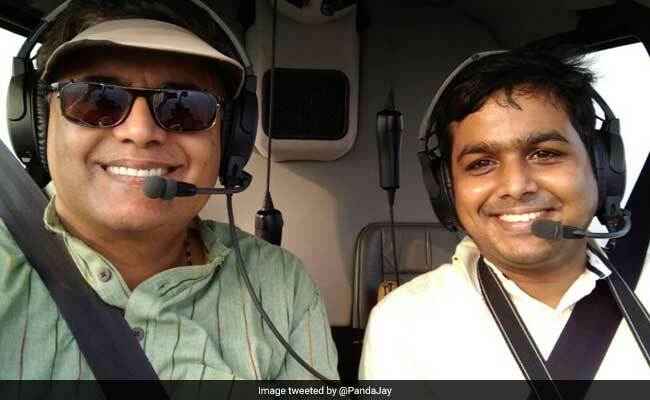 Calling the experience "fun," Mr Panda said his reward for taking Dr Pradhan on a "helicopter joyride" was his mother's arisa pitha - a much-loved delicacy from Odisha. According to his official website, Mr Panda holds a private pilot licence for aircraft and helicopters. In his Twitter bio, he writes he has clocked over 1,500 hours of flight time in a helicopter. On Twitter, people can't help but wonder when they'll be able to hop on a chopper piloted by Mr Panda. @PandaJay@WeAreBBSR@sujay365 Sir, I m a voter of your constituency. My Bou makes delicious Arisa and Manda pitha. Mera Number kab ayega Bhai? @sambitlnt@PandaJay@sujay365 Jay Sir... Neither I am from Rourkela nor a native of Kendra pada... But my Mom makes delicious Aarisha Pitha.. So there you have it: spend some time volunteering in Mr Panda's constituency of Kendrapara. Homemade delicacies from Odisha, while not essential, may help your case.